java code. 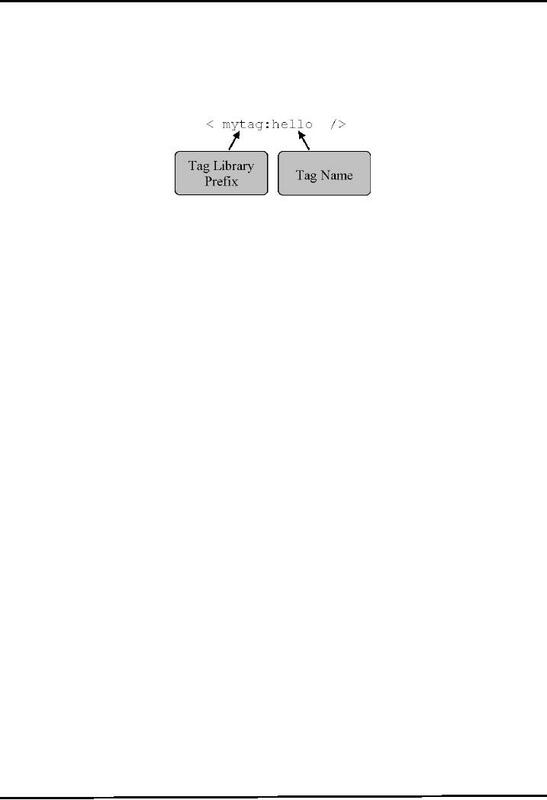 To overcome these issues, java provides us the mechanism of custom tags. example of last lecture. Of course, not all code is given here; it's just for your reference to give you a hint. you must have realized how significant changes custom tags can bring on. of selected course after reading it form database. -< jsp:forward ...... /> etc. Provides cleaner separation of processing logic and presentation, than JavaBeans. Have access to all JSP implicit objects like out, request etc. Can be customized by specifying attributes. built either by using JSP 1.2 specification or JSP 2.0 (latest) specification. Usually extend from SimpleTagSupport class that has already implemented SimpleTag interface. · Invoked when the end element of the tag encountered. JSP implicit objects (e.g. out etc) are available to tag handler class through pageContextobject. pageContextobject can be obtained using getJspContext() method. For example to get the reference of implicit outobject, we write. · It is a XML based document. · Place Tag Handler class in myapp/WEB-INF/classes folder of web application. · Place .tld file in myapp/WEB-INF/tldsfolder of web application. < mytag:hello /> where mytag is the name of prefix specified in taglibdirective. class. After that, Tag Handler will write the appropriate response back to the page. Example Code: Building simple tag that displays "Hello World"
the tag will display the respective course outline in tabular format. No changes are made to this file too. String sql = " SELECT sessionNo, topic, assignment " +" FROM Course, SessionDetail" +"
of displaying course outline in tabular format. * Declaration of pageName property. * Setter for the pageName attribute. This page is used to display the course options to the user in the radio button form. Java A Lab Course by Umair Javed.